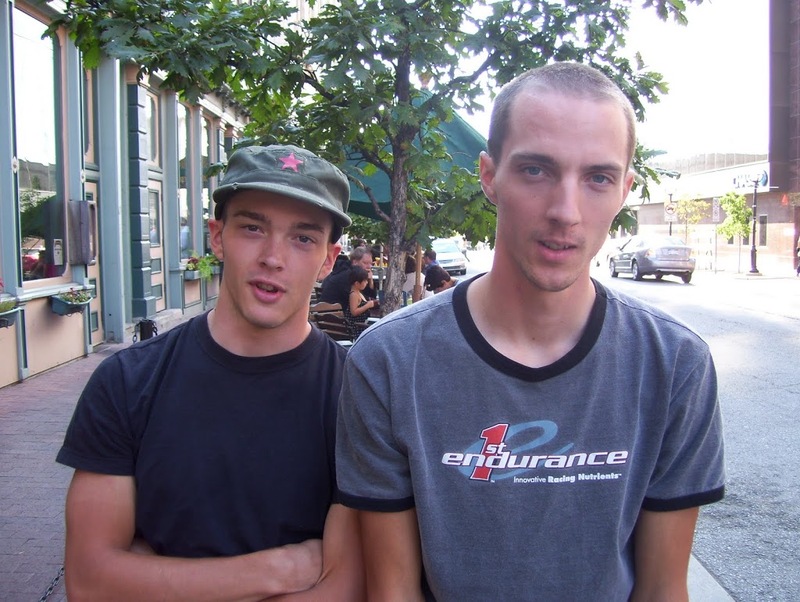 The photo below was taken by older sister Elizabeth in the fall of 2008, after we’d finished the Ann Arbor criterium. It’s been one of our favorite photos for a long time, as it adequately captures how we were both feeling about bike racing at this point. I’d quit the race early and went to the Arbor Brewery to have a few ales instead of finishing the race. Graham had soldiered on through the end of the race, but wasn’t feeling so well. Graham’s look of disgust, and my oozing apathy have made this photo legendary among the Howards. It’s been nice to have him around for the past few weeks. It’s been two years since I started teaching and traveling, and since I’ve given up on the pedaling adventures, we haven’t seen too much of each other. But as is evident from the more recently taken photo below, it’s clear we haven’t changed much. Graham’s gone on to feel disgusted with other things than bike racing, and my apathy and cynicism have similarly branched out to new areas. As often happens, after you leave college and begin working, I guess. 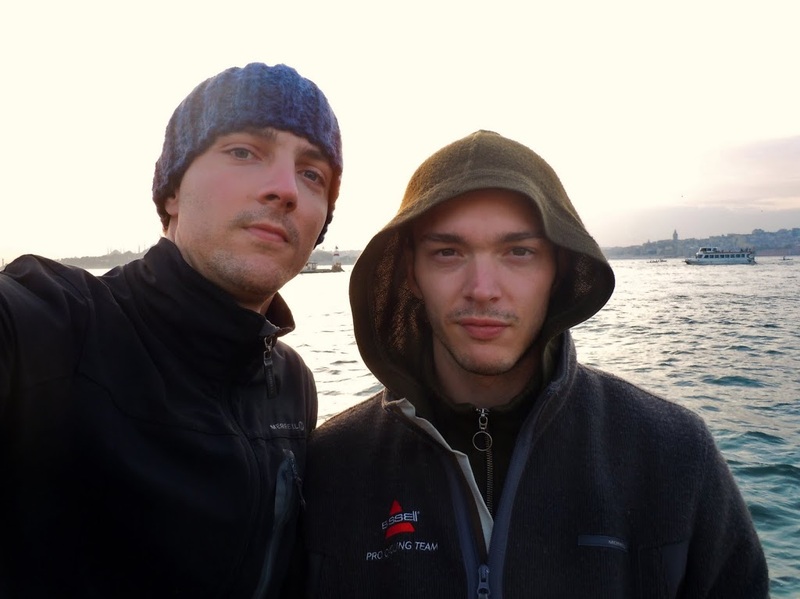 Sven and I recently went to Istanbul’s fruit and vegetable market. It’s a weekly affair and happens on Sundays. Sven had yet to see it with his own eyes, but had been hearing grand reports from his colleagues of procuring kilo upon kilo of fresh fruits and vegetables for kuruş on the lira. His fantasies of late had been dominated by this market, this land flowing with affordable fruits and vegetables and this past Sunday he and I, armed with grocery bags and dreams of nutrition, sallied forth towards this mythic market. We were successful in our quest and indeed there are to be found fruits and vegetables for one lira per kilo. We lugged our plunder back to Sven’s flat and began putting everything in its proper place. It was at this point that Sven unearthed something startling. Hearing (by now very familiar to me) him release an utterance of perturbation – in which is expressed an unsurprising, yet still irrepressibly disappointing discovery – I turned his way and addressing his furrowed brow inquired as to the source of this unwanted ailment. “Well,” he began, scratching his m(N)ovember with seasoned frustration, “it’s all rotten.” He handed me a tomato. I wiped off a layer of soot and saw what he meant. In addition to being undesirably squishy, it was spackled with sores of some sort. It wasn’t one of those “Fresh Produce” TV or billboard advertisement tomatoes that springs across the counter top with its healthy and fresh cucumber and eggplant friends. No. This was more like a drug rehab tomato, it that’s possible. It should be mentioned as well that Sven and I approached this shopping venture the way we approach so many things, i.e. with a sort of “that’s how you think it is ‘eh? Well, we’ll just see…” attitude. We weren’t going to pay regular bargain market prices, no no no. We were going to summon all of our cunning and really make out like kings. Ironically, the tomatoes had been our most prized find. Our plums were our second finest acquisition. Sven pulled one out of the bag and inspected it. Sadly and as expected, it had the feel of a wet bean-bag. In order to keep from falling into low spirits, we quickly set to sanitizing and performing surgery on our tomatoes and sat down to our snack of rehabilitated tomatoes and told ourselves that really, this was a tremendously productive experience. We’ve learned a valuable lesson amid all this – spend more than one lira on fruits and vegetables. In the spirit of learning lessons from fruit, I’ll share another lesson I recently learned with the hope that this may aid in sparing someone else what was for me a traumatic near miss. The day was September 6th and I was at the bus station in Wrocław, Poland waiting for a bus to Prague. The bus was late. I had expected this, but one can’t wisely or responsibly plan on a bus being late. I had been waiting for some time and was growing bored. Inside the bus station there was a little grocery store. I had a few zloty left and I figured I might as well get myself a snack for the bus. Walking through the aisles I decided on some nuts and was considering some dried fruit. I stood in front of the dried fruit shelf for a while. I’d been experiencing some abdominal discomfort for the past few days, and while staring at the shelf of dried fruit I came to wondering if I just needed a little digestive encouragement. Deciding that this sounded quite sensible, I grabbed a packet of prunes and went to the checkout. Having paid, I went back outside to continue waiting for the bus. I sat down, opened the prunes and started to eat them. Mind you, I have some experience with prunes and dried fruit in general, so I was mildly aware of the arena into which I was entering. I began, therefore, with conscious respect and reserve. Comfort can be gained quickly, however, and before I knew it I was halfway through my packet of prunes. I hadn’t felt anything yet, if you will, but airing on the side of caution, I sealed the packet and put the prunes away. It was at about this point that I began wondering if this had been the wisest course of action on the eve of a long toilet-less bus ride, which is not likely to be pit-stopping with any great frequency. There was still no trace of the bus and I was hoping that, should the prunes behave as prunes can, that it would begin and end with haste. Shortly thereafter, I watched a bus pull into the station and come to a rest in front of me. I stood up, and in standing felt a shock-wave reverberate through my being. For a moment I was paralyzed. Feeling perspiration beading up on my brow, I inched around to the front of the bus. “PRAHA” the sign in the window read. I began to weigh my options, but as is so often the case in these matters, the decision was made for me. My mind was racing but I was thinking of one thing and one thing only, the WC. I grabbed my backpack and began moving with the burning knowledge of having precious little time, but with the limitation of being unable to exert much physical effort. I hurried as best I could. During my scramble I managed to retrieve change from my pocket and get my belt unfastened. I paid the attendant and collapsed into the nearest stall just in the nick of time. We all pray to God in our darkest hours, and never have such cries been sent to the heavens from the Wrocław bus station as I sent in that WC on September 6th, 2011. After what felt like an eternity, the lord saw me through and I emerged, though shaky and but a shell of my pre-prune self. Thankfully, the bus hadn’t moved. I managed to get on, found a seat and prayed for that to have been the end of it. Sadly, skies darkened about forty five minutes later. There are all kinds of books and philosophies available concerning meditation, but I doubt anything summons you to find your center like a belly full of prunes on a toilet-less bus from Wrocław. God was gracious again though and we pitted for a smoke break, thus allowing me to seek the relief I so desperately needed. Hobbling back on the bus I felt like a cripple and really hoped my way of going would be somehow other than by prunes and in a big-foot toilet somewhere in Poland. Ah, and God’s grace is indeed great for I was spared a third calling and made it to Prague still able to stand on my own. Again, I share this tale of woe and hardship only with the sincere hope that others may be able to avoid this discomfort I so tryingly endured. Don’t, I implore you all, don’t eat prunes at the bus station.